This week I listened to vintage Diane Rehm episodes. She has already retired from her daily radio show, but before she did, she replayed old favorite episodes. In one, an interview with her best friend, they confess that they’ve spoken to each other every morning at 7am for over thirty years. ADULT. GOALS. 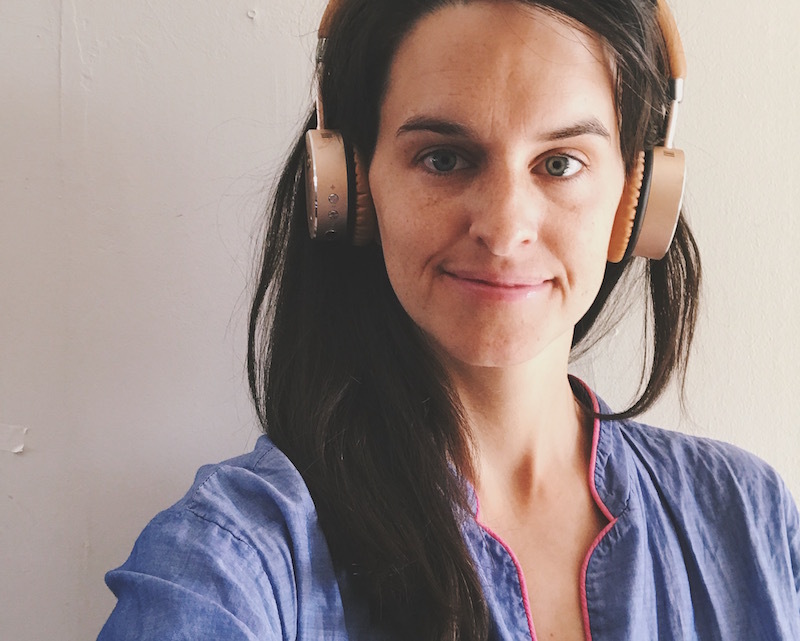 But I began by listening to her interview with Fred Rogers, a show which sounded like a pillow and a blanket had curled up to talk to each other and recorded it for radio. Quiet and deeply soothing. I listened to the whole thing on the couch and nearly teared up it was so encouraging. After the episode finished I immediately hunted down the current best-method to watch Mr. Roger’s Neighborhood, which is: all seven seasons streaming on Amazon, free to prime members. What a gift to modern parents! The girls have both watched Daniel Tiger, the cartoon iteration produced by PBS that carries many of the same sensibilities (and the background-ambient feeling that this is all just a rouse to make better parents out of us), but I see a big difference between the shows. On the Neighborhood adults are running into each other all day and interacting: well mannered and thoughtful. You see adults shaking hands, asking after each other’s health, thanking each other, and bidding good day. You see Mr. Rogers make a point to greet his local shoe salesman, his grocer, his milkman. Watching this social courtesy modeled in slow-motion on television is really quite something. Another wonderful thing from last week: I had the great pleasure of visiting 177 Milk Street, Christopher Kimball’s (founder of Cook’s Illustrated) new endeavor in downtown Boston. Like Cook’s Illustrated, Milk Street has a TV and radio show and a bimonthly magazine. However, unlike Cook’s Illustrated, they have designed their kitchen to host monthly classes and talks. It is a wide open space with fabulous big windows, located right in the heart of downtown. They are offering free cooking classes to Boston teenagers, which is so cool. I went with a gaggle of wonderful-cook girlfriends to see Julia Turshen. Julia was a wee bit shorter in person than I expected after seeing many photographs of her fabulous hair. She was soft spoken yet an amazing public speaker. She made several simple recipes for us but even in their simplicity we were all able to pick up a few professional tricks. For example, before mincing garlic, she always crushes the cloves under her knife to flatten them. Genius. When adding garlic to a pan of olive oil, she tips the pan for a minute so the garlic can merrily slosh around and very-nearly fry. She said she roasts pretty much everything at 425–easy to remember! There’s something reassuring about watching a professional do things you do in your kitchen every day. So we began with glasses of wine, potato chips, and scoops of her scallion chip dip. Then we sat and watched her cook (luxury! ), then we got to taste everything and get our copies of Small Victories signed. It was really fun and I highly recommend it for your next outing. 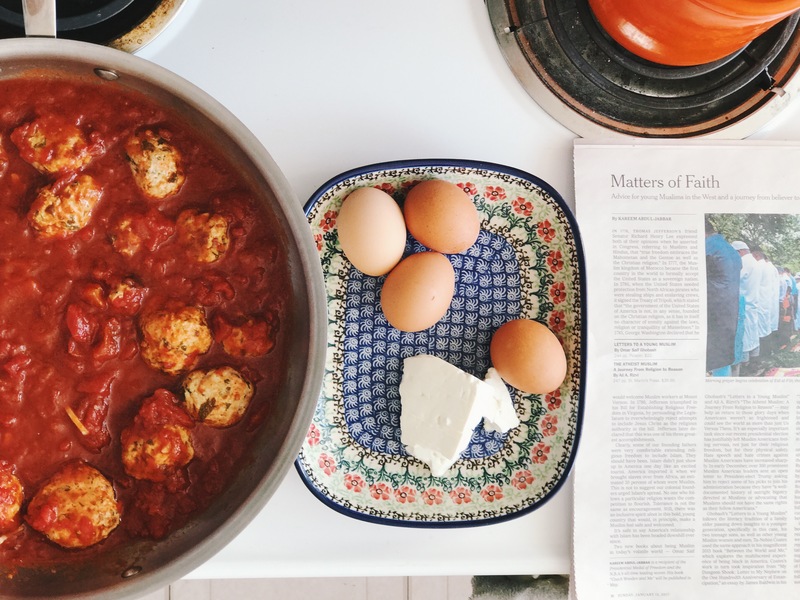 The photo above is from when I made her turkey and ricotta meatballs along with her very easy to doctor-up can-of-tomato sauce. The next morning I turned the leftovers into shakshuka, where you poach eggs in the simmering sauce (takes about ten minutes, just dump them in and put a lid on the pan) and then serve with a crumble of goat cheese. This entry was posted in Boston, Boston Food by Rachael. Bookmark the permalink. I made those meatballs last week and they were delicious!! Sounds like you had such a fun night. Oh also, on the trip, we discovered that you can’t pair two headphones on one iPad which kinda stinks. Apple get on that! I really enjoyed this post, Rachael. Yesterday I put Small Victories on hold at my library. :). a Literary City Guide to Boston, by me! ideal itineraries for Boston, on Pinterest, by me!